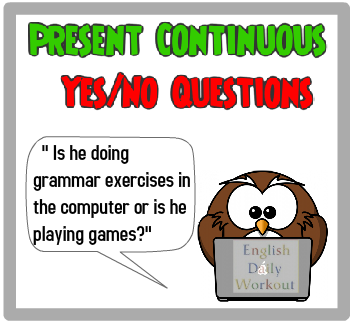 In the Present Continuous, the verb to be acts as an auxiliary. As is the case with other English tenses, it is the auxiliary which is used to form questions and negative statements. I am working. Am I working? You are working. Are you working? He is working. Is he working? She is working. Is she working? It is working. Is it working? We are working. Are we working? They are working. Are they working? 1. Am I learning English? 2. Are you carrying a parcel? 3. Is it growing colder? 4. Are we living in Halifax? 5. Are they running a race? 6. Is he drinking coffee? 7. Is she shopping for presents? 8. Am I cleaning the window? 9. Are we buying pencils? 10. Are they playing football?